Purpose: To defend Servia and the world. History: Generacija Tesla was founded by Nikola Tesla, a Serbian and one of the greatest scientists in history who evaded his own death by transferring himself to another plane of existence. He resurrected a number of humans slain by the evil Kobalt, transforming them into superhumans who could counter the threats of such villains. Portal's younger brother Misha was a later addition to the team. 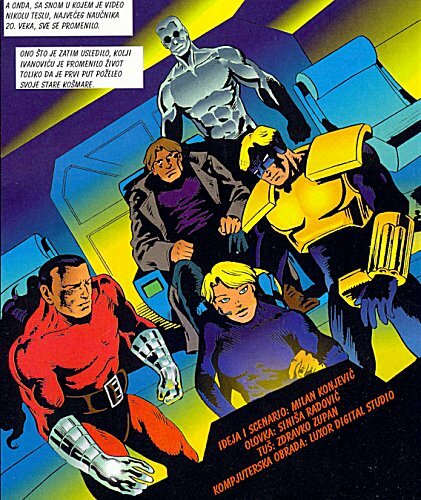 Allies of the team were doktor Marko Nemir (nemir means disturbance in English), Saw's friends from the circus he was raised in and other heroes from the Luxor universe. The enemies were Kobalt, the Black ones, Death Syndicate (Tristan - the guy with tentacles, Bodlja (Spike) - girl with spikes and Kras (Crass) - hulkish retard), hi-tech / talk-loving werewolves and some demon named Shobosh. Comments: Thanks to Borivoje Grbic for informing me of these characters, and providing all the information and images too.